This is just a short wrap-up post. 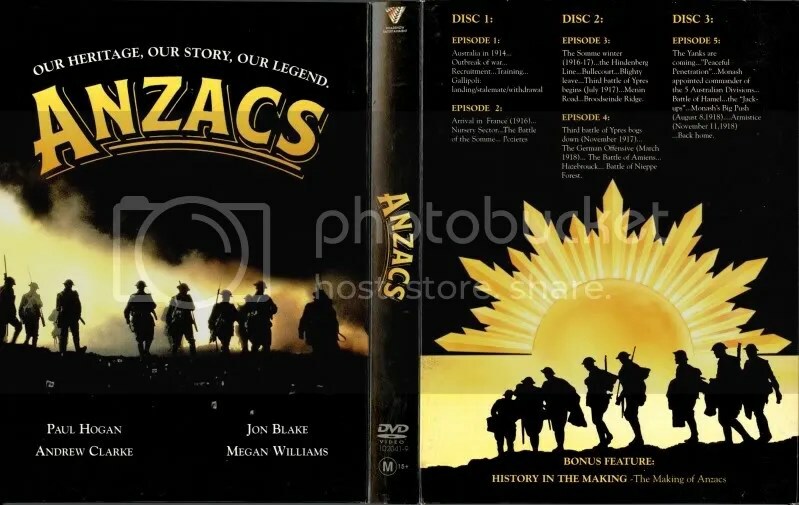 I finally watched the last two episodes of the ANZACS mini-series and I liked them as much as the first three. There were a few predictable moments and the end was a bit anti-climatic but very realistic. I would really like to recommend the series once more. It’s excellent. It’s also an amazing story. The bravery and courage of the ANZACS was really something. I already said it in another post that one thing that struck me was the way they went to war. They took it like some sporting adventure, they were big on comradeship and good spirits. It seemed a bit stretched at first but I’ve done some research and some of my readers confirmed that this was the way they were. What you get to understand as well, when you watch this series is the huge difference the end of the war represented for the Australians and the French. All through the series you see the ravaged landscape, the bombed villages and although some places remind the lads of home, their country remained untouched. I’m not saying the contribution wasn’t great, no, but when they were finally back home, they could really leave the war behind. That was not possible for the French soldiers who had to cope with a devastated country. The land has still not fully recovered until today. There are still places where you see craters and trenches, where they left the barbed wire and there are still bombs exploding. While Part IV is still heavy on combat, Part V, which is a bit anti-climatic, is a quiet part. It centers on the Armistice and the ANZACS’ return home to Australia. Here are the reviews of Part I Gallipoli, Part II The Somme and Part III Passchendaele. It is debatable when watching a series whether you should review each installment individually. I haven’t done it for The Pacific, nor for Hornblower or Sharpe, so why now do it for ANZACS? Because it is so good? Yes, it really is but so are the others. That’s not the reason then, the reason is that I’m in the mood to do it. Not everything needs to make perfect sense in life, occasionally we can do something just because we enjoy it and I enjoy reviewing ANZACS. There are not all that many good movies and series on WWI, it seems justified to re-emphasize that this one exists. Part three is a s good as the first two parts and leads us even deeper into some of the catastrophic and notorious battles of WWI. Who hasn’t heard of Ypres or Passchendaele, who hasn’t heard how many soldiers died in these two offensives alone? In this part we see that the British Prime Minister, Lloyd George and General Haig are really not on the same page. Haig is gung-ho, his strategy seems to demand too many losses and Lloyd George doesn’t think it’s justified at all. Once more we also see how the British and the Australian culture clash when it comes to subordination. Another aspect that is covered in this part is the role of the respective churches. While the Church of England was fully supportive of the war, there were some voices in Australia saying that it might be high time to underline that Australia was independent by now and that the Australian church should adopt another attitude towards the war. The man on the photo, Jon Blake is one of the main actors in ANZACS. He was also in in The Lighthorsemen. While finishing The Lighthorsemen he had a car accident and sustained severe brain injuries that left him in a near vegetative state. He died on May 29 2011. It’s a very sad story. He was a very promising young actor and many say he would have gone far. We will never know. Here are the reviews of Part I Gallipoli and Part II The Somme and a List of Australian War Movies. ANZACS part two takes us to the battle fields in France where the lads we met in the first part will take part in the battle of the Somme. Before they start to fight in the trenches they undergo a bit of training and are also shown the way the Germans fight. There are still humourous episodes when old-world hierarchy meets with Australian insubordination but this clash of attitudes is also very unfortunate. General Haig, as this episode shows, was less than thrilled by the Australian’s lack of obedience and thought it best to send them off to one of the bloodiest battle fields. Surprisingly they are doing very well. Where most other companies achieve nothing they manage to capture some terrain and there are also more and more losses among the Germans. The British high command is surprised by this can-do attitude and the ability to fight demoralization however they still refuse to recognize their valor. At the end of the episode the heavy fighting has taken its toll anyway. The men return extremely weary and it’s hard to imagine that the ordeal only just begun. In episode I an Australian journalist had an important role in covering up the senselessness of the battle at Gallipoli. We see the same journalist once more. He is the Australian prime-ministers’ spokesman and has to find out whether the Australians are not just sacrificed. He points out that they haven’t really won a lot of terrain so far. He is informed that it isn’t only about winning terrain but about wearing out the Germans. The trench scenes are very convincing. These are trenches that crumble, they have been under such heavy fire all the time, that they are merely shallow dug outs. Usually the trenches we see in WWI movies are very high. The fact that they had to be reconstructed constantly and did at times hardly give any shelter isn’t shown very often. Like in part two, the story moves between the battlefields and the home front which adds to the authenticity. I enjoyed part II even more than part I (see review here). I need to thank Soldier’s Mail who left a comment on my post Australian War Movies: A List mentioning ANZACS. This is really, really worth watching. ANZACS has five episodes in total and I have just watched the first one that could be called “Gallipoli”. I would say it is easily as good – if in parts not even better – as Peter Weir’s movie Gallipoli (one of my top 10!). The series starts in Australia where the young guys, full of enthusiasm and inspired by a sense of adventure, enlist. While some of their parents think it is their duty towards their motherland (some can still not fully grasp the idea of being independent by now), the young men see the war as a means to travel and see the world. A bit of fighting will be great as well. Why not bash some Germans? Sounds sporting, right? They are a composite little group heading off to Europe (as they think). Some are farmers, some are sports heroes, others are students. When they finally arrive in Gallipoli, they are told that they will fight the Germans by entering the back door. Once they have overrun the Turks there will be no stopping them and victory will be certain. Gallipoli is one of those names that stands for an unsuccessful campaign and battles in which losses were extremely high. The young lads are mown down by Turkish guns like weeds and the sporting spirit dies as soon as they have lost the first among their ranks. I couldn’t help wondering whether the British sent the Australians on purpose on this futile mission but considering that they lost as many and more of their own in France and Belgium, it seems more likely that high command had simply no clue what they were doing. Anyone reading this who is better informed is welcome to explain/contradict. I liked the way this first part was told. It seems very accurate, very realistic, not overly emotional. There is a couple of brothers and friends who are devastated by the loss of their siblings and friends but this isn’t overly exploited. I’m extremely curious to see how this will develop and whether the next episodes will be equally good or even better. At the end of episode one they were ready to move on to France.